In (hopefully) the next couple weeks we’ll be releasing an updated version of the MOTHER 3 translation patch that fixes a few little things. We’re also planning on releasing our tools and files to the public, hopefully at the same time. Update: Given the latest announcement by Itoi, we might hold off on releasing a new patch and/or the tools, depending on how things go. So it might not be quite as “soon” as I’d originally planned – but we’ll see. Update (May 2013): My offer to Nintendo a few weeks back somehow made big waves in the gaming news world, so for the time being I think it would make more sense not to release any new stuff for a while. I do plan to release a new patch and the translation tools sometime, just not right now. I’ll keep readers updated as things happen, though. Are saves compatible from one version to another? Is there a list of every change? Yes, the save is somewhere in the emulator. The saves will be compatible. I don’t know if I have a detailed list of every change, but it’s mostly a few text fixes and a few rare bugs that got fixed. Awesome! It’s great to see you still showing so much interest in this project. Another excuse to play the game again! Again, that’s not something we can feasibly add back. Someone else is gonna have to do that sometime, that’s far beyond the scope of our project. I didn’t even know about it until just a few weeks ago, in fact. Thank you! I was just considering another run-through and like HpBoost says a new patch is a good reason to play it again. I recall there being a layer problem in one of the maps where two squares on either side of a door would go on top of character sprites. I can’t recall exactly where that is, but I’m sure someone else remembers. Is there any fix for that, or is map editing beyond feasibility? I mean, it meant pretty much to you back then. And it actually still means quite something to me. Or are you talking about other tools and files? blahmoomoo: That’s not really something we can fix. There are things like that in EarthBound too, so it’s not too out of the ordinary. V-King: Jeff and I have gotten way too busy to support the other translations the way we originally intended – whenever a group needs help or whenever someone wants to start a new translation it’s always a lot more work than either of us imagined. In some cases, it’s even slowed down or prevented other translations from happening. It doesn’t seem fair to us or to people who genuinely want to translate the game but can’t, so we decided recently to release the tools to the public. What are you fixing in this patch? Will any thing change with the music? Only a few typos and a few text-related bugs are being fixed – there’s no new content or fixes to non-text stuff. Yep, that’s fixed. It’s been fixed for years, we just haven’t released a new patch since then, heh. Is that a pre-XP version of Windows, or are you using the classic theme? I’m pretty sure that the Beef Jerky item is not Beef Jerky in Japan… It would be nice if you changed that. rubber cat: Interesting, I’ll give the Japanese lines a closer look too, you might be right. MotherFan: It’s ほしにく in Japanese, which is more literally “dried meat” or “jerky”. It was translated as beef jerky in EarthBound, so I did the same for here, even if the picture does look a little odd. Oh, that’s great! But yes, it would be wonderful to have Duster’s unused tunes fixed… i wonder if someone can do it…? 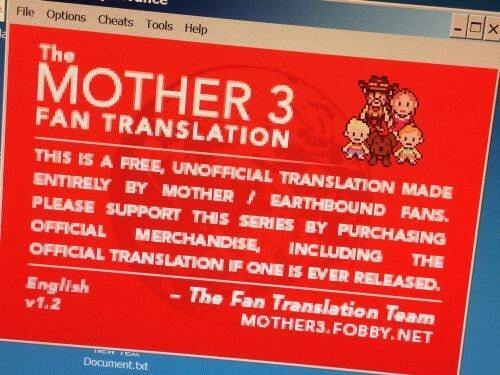 Aw, I was planning to start MOTHER 3 with the new patch. Looks like I’ll just play the old one then. And Mato, I don’t really see why you would hold off on releasing the new patch because of the Itoi news. It’s not like america is going to get anything if they decide to re-release the games and even if they did, it wouldn’t change anything. Mr. Itot, I have an idea for you. If you are really doing something about these games, please release them in Europe first, because none of these games were officially released there (although I believe that most Europeans are playing the series by using emulators, maybe even NoE already know this, but they are not bothering the players). America second (because EarthBound was released there). Japan last, because you got all the games. Why are you guys holding off on the release? I don’t understand. Like I said, once we know what the deal is we’ll probably release the new patch then. Yeah but the patch is already out, it’s not like releasing version 1.2 (or the tools) is somehow going to negate the previous versions releases or hurt any hypothetical 3DS/WiiU release of the game. 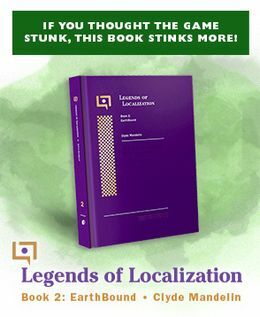 Indeed, but I’d prefer to avoid the above example – the translation will still exist and we’ll likely release 1.2 at some point eventually, just not right now. Which is nice anyway, since I’m having some last-minute trouble with the updated disclaimer screen code. That makes sense. You certainly wouldn’t want to take any publicity away from a US release if one were to come out. hey mato, how come most people use emulators on their computers but don’t know about the emulators for the GBA SP like supercard and EZ-Flash?? Because computers are more widespread and common, I guess. Hi, i have been playing this game for a long time, and one thing that bothered me (i hope it’s not just me) is the name ”Hinawa”, i know i can change it in the naming screen, but still, i don’t get why you went and translated beatifully all of the names, yet ‘Hinawa’ is the only one that feels out of place, is there anyone called ”Claire” in the whole game? i really like the name ”Claire” and i think it fits her perfectly. I’m slowly working on a new version of my translation notes too. I’m not sure when they’ll start getting posted though. wow, thank you. I really hope that a new name for her comes on board. i wonder, does anyone ever tried to make an Uncensored version of EarthBound? you know, Treek, parent abuse, the death/hell themes, i think it would be very interesting. @Dennis its Threek not Treek. It was censored for Three k. Its a harmless name though just overprotective Nintendo. As for child abuse there is really only Pokey getting spanked, which (in my eyes) in the risk of sounding cynical, isn’t child abuse. Yeah, thanks for the corrections i appreciate it. but still,there is a lot more stuff that was censored for the american release, and like the newest Mother 1+2 translation (which had several stuff re-inserted because for some reason they ported the NES version instead of the Famicom version)i would love to see an Uncensored EarthBound. I did notice a typo at the end of chapter 3 (the salsa one) it was that scrolling speech. It said Lucas was becoming a great son or something. But it was spelled “sun”. Just putting that out there. Anonymous: No, “sun” is correct in that case. It says he’s becoming a bright sun that drives the darkness away or whatever. I just found out that when I use the “R” button to open the map in the sewers in New Pork City, next to Leder, the game shows me the Thunder Tower map. Maybe it’s like that in the original game? I don’t know. It is, it’s a weird bug that I’m not sure how to fix. Hey Mato, it says the Thud Charm protects against all status effects but I was still effected by the cry status. Is this a bug? Hmm, interesting. We translated it as-is from the Japanese text, so it might’ve been an oversight. Or maybe crying isn’t considered a normal status ailment? This is the first I’ve heard of this, so thanks for the tip! Mato, are you going to fix the broken-by-frog save game glitch in porky’s thunder tower room? Or is the glitch fixing for that particular problem not possible? Has the balloon frog trapping you when you load already been fixed? Please answer soon and thanks for the english patch. Earthbound one crafted with the same amount of care and artfulness. Theres a glitch where if you put the cursor over the thing that lets you re-battle your enemies the music gets all weird. Frogslime: That’s not really something I can fix, or at least not something I can fix easily. The easiest idea might be to simply move the frog, but it might still cause problems in other ways. Someday someone will figure out how to fix it though. Also, I’ve talked with the Fangamer people and they’re all very eager to work on other handbooks for other games, it’s just that it takes a TON of time and money to put them together. I’m currently pushing for a Mother 1 guide (along with a few other people) but who knows if/when it’ll ever happen. And here I thought Mato-Man could do anything with Roms. Well, I’m still hoping (hopping) that you’ll make the time to fix it. I’ve been playing that part of the game in continuous fear that my save with Boney having flint’s hat would become broken. And in other news I’m hoping that a good full length Mother 1/3 hack will arrive soon or eventually (probably not soon) and with a great new story. Now lets all get our hopes up for that and for getting that %!#?!&#! rare item. I’ve grown fond of Hinawa over the years. It no longer sounds scary foreign to me. Frankly changing it to anything else would remove that bit of charm from the game. It’s odd that she alone has a Japanese name when the original writers went through such work to give everyone else western names, but I think I’m fine with that. The “Nowhere Islands” feel like they’re extremely loosely based on the Hawaiian Islands anyway, and there’s a solid Japanese population there, so maybe the name makes more sense that way. At any rate, it’s a nice sounding name anyway, not a clunky or hard to pronounce name at all, so it works. Not sure “Claire” fits any particular theme, but oh well, at this point it’s best to keep it as is and for anyone who really doesn’t like it, there’s still the name change option. Same way I’m free to rename “Terra” to “Tina” when I play FF6, or “Aeris” to “Aerith” in FF7 (the latter apparently now her official name, but rereleases of the game have all been emulations with no changes to reflect that, even though the game is sorely in need of retranslation). I really hope the news is something like “We’re releasing Mother 1-3 in a grand 3DS collection! We’re calling it the Memories of Mother Photo Album!” I really hope Earthbound remains untouched in the US. I know their lawyers try to prevent lawsuits in the first place, but Nintendo needs to show some conviction in it’s products and just release it without (further) changes. The music is too good without some cheap last minute song replacement by some other artist that won’t fit the game very well and they’re sure to win any lawsuits anyway. I wonder though. Would there be any way to slightly alter how the opening “confirm all these names?” screen functions? As it stands, the game slows to a stuttering crawl after hitting that final “okay” option, as the dialog boxes fade out. Now, this is all a result of the workarounds you had to put in place due to the limitations of Mother 3’s weird “graphical text” system there. However, would it be possible to simply wipe out all the text in all the on screen boxes during that fade, or simply have it instantly go to black, to allow the system to play back those sounds without issue? I’m not sure if this issue can be eliminated with an emulator. I imported a copy of Mother 3 to stay legal and even got an EZFlash 4 cart for my GBA (hard to find these days) to load the translated ROM on the system it was made for. At any rate, if either of those two options won’t work to solve that issue, then I’ll understand. As it stands, I can always plug in the Mother 3 cart to hear those sounds the right way. In the translation notes I’m working on I actually go into more detail about the confirm screen and why it still haunts me – trust me, I tried everything I could to keep that choppy stuff from happening. In fact, it used to be WORSE than it is now until I wrote some code to alleviate it somewhat. Now this is reeeeeeeally nitpicky, and something that would be gone in a flash if text speed is set to high, but I remembered you were asking. Yeah, that’s mentioned in the readme – it’s something that’s really, really crazy and we don’t know how to fix it yet. Yeah, I haven’t decided what I’m going to do yet. No worries, though – if I do make an updated patch you can bet it’ll be on the front page of this site and on the M3 blog! Any idea when it might be out, Mato? I updated this post with some more info. Right now I think it’ll be better to hold off for a bit but I plan to release a new patch eventually. At most it’ll have just a few typo fixes and stuff like that, so it’s not going to be anything major anyway.